When she was six years old, Esbe bought her mother a birthday card, bearing an Art Deco Erté design. It was the first card she’d ever bought and the smooth elegance of the 1920’s made its’ impression at that very early age. Audrey Beardsley is another influence she takes from the glitzy era of Art Deco and you can see it reflected in the graceful lines that define Esbe’s work. Esbe fishes from this pool of magazine cut-outs for inspiration, prompting a painstaking drawing process. Once a composition has been refined on paper, Esbe enlarges the outline transferring it onto canvas, ready to paint. Esbe had never really been interested in sport before the Olympics came to London. She cycles but wouldn’t describe herself as sporty and she doesn’t follow any discipline or team. This unexpected connection with the Olympics coupled with stumbling upon a magazine image of a cyclist inspired the creation of the first of a number of sports related pieces. Esbe originally teamed up with a small factory who helped her to develop a sports themed collection onto glass. This body of work then developed into a collection of paintings on canvas. Esbe’s collection is made up entirely of sportswomen; from gymnast to water skier, surfer to tennis player. It wasn’t a conscious decision to begin with but as the ideas developed, the collection grew into a celebration of women in sport. 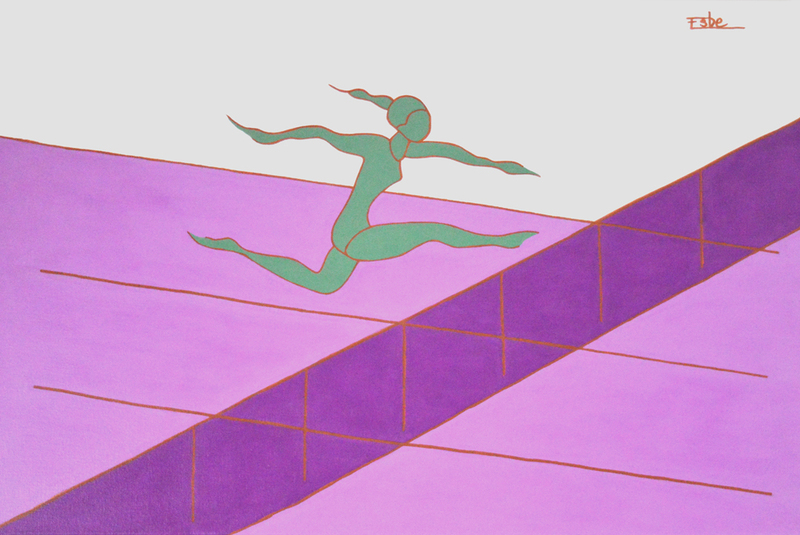 Esbe has mined each sport for elegant shapes and successfully converted these into stylishly simple paintings. Although it’s early days, her perfectionist nature and clarity of process promises more interesting and refreshing work to come. Watch this space.